Board Members in attendance were: Rob Frits, Nancy Brown, Jerry Martin, Judy Hammond, Hope Feiner, Ralph Gresham, and Jamey Smithson. Also in attendance was newly elected board member Bobbye Kelley. Board Members absent: Rob Stark. Also in attendance were Alicia Hines, Treasurer; John Duke, Property Manager, and Officer Scott, Springdale PD, and resident Matt Baker. The meeting was called to order at 6:31 p.m. by President, Rob Frits. The Swim team coach, Jill Young, requested permission for the team to host a swim meet at the HBM pool on Thursday, July 10, 2014, for 2-4 hours, possibly from 4-7 p.m. The pool would need to be closed to residents during that time. She will handle the entire setup with help from volunteers and she suggested additional parking (with an estimated 80-100 cars) at Young Elementary. Discussion followed. Rob Frits voiced concern that other residents would want to close the pool for private parties. Tom Jefcoat stated that this was basically a neighborhood function, which is instructional and developmental since the Har-Ber Ducks are composed entirely of resident children. Jerry Martin moved, seconded by Ralph Gresham that we closed the pool for the swim meet one time only. The motion passed 5 yes-2 no. Fire Marshall Miller of the Springdale Fie Department was here concerning the parking problem around the ASN (Arkansas Support Network). Dr. Manning was also present due to the parking of ASN clients in his lot and not using the ASN parking lot. Miller stated the road width is 27′ and a fire truck requires 20′ minimum. With cars parked on the road, fire trucks cannot move through Isaac’s Orchard. Dr. Manning added the fire trucks cannot get to his clinic in case of emergency. Miller said the road width requires signage and suggested painting the curb red and marking it as a “fire lane”. Miller will contact the city and request that they paint the curb restricting parking. Dr. Manning added that he would like signage to limit his lot to his patients since he owns the property. Secretary’s Report: presented by Hope Feiner. Thank you to Hope for taking and typing the minutes during Nancy Brown’s absence. The minutes were emailed to board members for their review prior to tonight’s meeting. 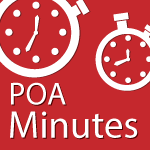 Jerry Martin moved, seconded by Jamey Smithson to approve the May 2014 POA minutes. The motion passed 6-0. I sent the financial reports to the finance committee earlier this week. After discussion, they have approved and asked me to send out to the board. I have also attached the current customer balances. The previous boards asked that we give a little time for folks to pay (June 15th deadline) so after June 30, I will start collection notices. I have been asked what the total cost of the Crumpacker park and I am working on that info. I am not sure that I have received all the invoices. I have spent many hours updating the pool list – we have many renters and owners who have “many roommates” so it has not been an easy process to keep the list updated. Jerry Martin moved, seconded by Hope Feiner to approve the April financials. The motion passed 6-0. Jerry Martin moved, seconded by Hope Feiner to approve the May financials. The motion passed 6-0. Thank You Cards – sent to the following for their support at the annual HBM picnic. Trash can has been delivered and will be installed the week of 6/23. John will mark where it is to be installed. Above are listed some options and costs. John has located someone to demo and install a rock sign like the one at the 56th Street entrance (including demo and tax) for $5600.00. After discussion whether to install a rock sign or rebuild the original type sign (redo the brick, paint the sign and add lights), Jerry Martin moved, seconded by Judy Hammond to replace the Hwy 412 entrance with a rock sign identical to the 56th Street entrance. The motion passed 7-0. The masonry company could not locate a matching brick. ACME Brick has inspected the brick and is currently looking for a brick that is similar in appearance. Ireland/Tall Oaks Loop North – Ordered 2/19. Luminare took longer than normal to ship due to the receptacle addition to the base. The pole is scheduled to arrive on 5/9. Pole has been installed. The base is no longer level. Morgan is scheduled to shim the pole on 6/20. The entire pool house flooded twice the week of Memorial Day. Pool equipment coupling in equipment room burst. Minor equipment repair. Floor drains were the cause of the second flood. Plumber cleared floor drain clog. No problems since repair. Water volume has been reduced to prevent water loss. Har-Ber Ducks would like to host a meet on Thursday, July 10 from approximately 4:00pm to 7:00pm. The main pool would need to be closed during this time. Williams Adams – 498 Founder’s Park West- violation letter was sent. Owner’s did not respond. Will send violation letters after Board discussion. Tall Oaks/Allie Francis intersection island repaired. John Duke added that the City has agreed to help with sidewalk maintenance and will take a survey to areas needing attention. Ralph Gresham inquired about the status of our two bridges needing repair by the city. John Duke will check on that again. Alicia Hines added that DTS construction still owns approximately 10 lots that are undeveloped and been taken over by the bank. She is actively pursuing back dues. Architectural Review Committee: presented by Matt Baker. Since Don Rutledge and Tom Jefcoat have resigned, we need two more volunteers with some knowledge of architecture and/or engineering. Will send out a web blast asking for someone to serve. He also reported that one resident’s request for red siding was denied. Security and Neighborhood Watch: presented by Officer Scott and Jamey Smithson. No parking in the circle drive next to the pool house. Two burglary attempts on Dancing Rabbit and Tall Oaks Loop. Don’t leave your garage doors open or cars unlocked and parked on street. Speeding is continuing on Francis Fair. Have clocked some cars at 73 mph. Will have to possible put double yellow lines down the length of the road and 3-way stops at each road connecting with Francis Fair in order to slow down the speeders. Algae is present in lakes different from lakes last year. The pumps are running for circulation and carp have been added to aid in algae control. Lake clean up next Saturday – meeting Saturday morning at 8:30 a.m. at Coyote Crossing bridge. There is mud draining into the lakes from Har-Ber High School through the rain drains. It is to the extent that it is filling in our lakes. John Duke will notify the city. There is evidence of some leaking in our man-made dams between the lakes. The water freezes in the winter an makes the openings bigger. The issue is serious and needs to be addressed. Yard of the Month: none. Judy Hammond would like someone to be responsible for this. Jamey Smithson added that he believed we needed added security for the swim meet due to the large number of people and cars expected. It would cost approximately $100.00 for 4 hours. Jerry Martin moved, seconded by Ralph Gresham to provide for the officer. The motion passed 6-0. With no further business, the meeting was adjourned at 8:10 p.m..
Respectfully submitted this 28th day of July, 2014.